The long saga involving Pittsburgh Pirates infielder Jung Ho Kang is all but complete. On Friday, the Pirates formally removed from Kang from the restricted list, placing him back on the 40-man roster. However, he will not be rejoining the team right away. Pittsburgh has optioned him to triple-A, where he has already played four games. There is no timeline for when the Pirates will bring him back to the big leagues. In fact, there is no assurance that will happen this season. Kang’s saga began back in December 2016 when he was arrested in his native South Korea for DUI. He received a suspended sentence from a judge in South Korea. However, when he tried to return to the U.S. for spring training in 2017, he was denied a work visa. It turns out the December 2016 arrest was not Kang’s first for DUI. He ended up missing the entire 2017 season before his visa issues were finally cleared up this past April. After a month-long program akin to spring training, Kang began playing in minor league games earlier this month while remaining on the restricted list. The Pirates were under no obligation to move him back to the 40-man roster. But now that he is, Kang will begin making a pro-rated version of the $3 million salary he was scheduled to make this season. 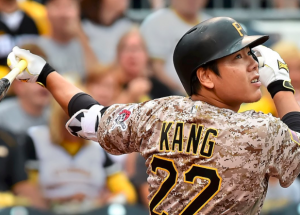 After missing a full season of action, the Pirates don’t feel Kang is back up to speed yet. After going 10 for 24 with three home runs in A-ball, Kang has just one hit in his first 15 at-bats at triple-A. The Pirates also have a crowded infield, so there’s not exactly a spot for him in the big leagues right now. However, the Pirates will be watching him closely, hoping that he’ll once again prove himself capable of contributing in the majors. There are whispers that the Pirates are planning on being sellers this summer if they can’t get things turned around in the next month. Middle infielders Josh Harrison, Jordy Mercer, and Sean Rodriguez have all been mentioned as possible trade candidates. Pittsburgh trading any one of those players could help open up a spot for Kang. Of course, Kang will also have to start hitting in triple-A. Over the course of his two seasons in the big leagues, Kang is hitting .273 with an OPS of .838. He was arguably Pittsburgh’s most important hitter during the 2016 season. If he can show signs of becoming that kind of player again, the Pirates are likely to exercise his $5.5 million option for the 2019 season. Kang’s behavior away from the field could play a factor in his future with the Pirates as well. Kang is participating in MLB’s substance abuse program. He’s also unable to drive while in the U.S. His translator is currently serving as his driver. Kang says he’s been sober since his most recent arrest and is intent on staying that way as he works toward a return to the big leagues. “Obviously, I’m not touching a drop of alcohol moving forward,” said Kang.